Long gone are the days when conventional sheet masks would be enough for our daily routines. This is the way I see it: there are skincare brands that cater to your basic needs and there are skincare brands that have revolutionised what it means to care for your skin. I’m not talking about multi-masking, no. I’m talking about taking aesthetics and skincare to a whole new level — this time, with a futuristic device that might just change the way we think about masking. 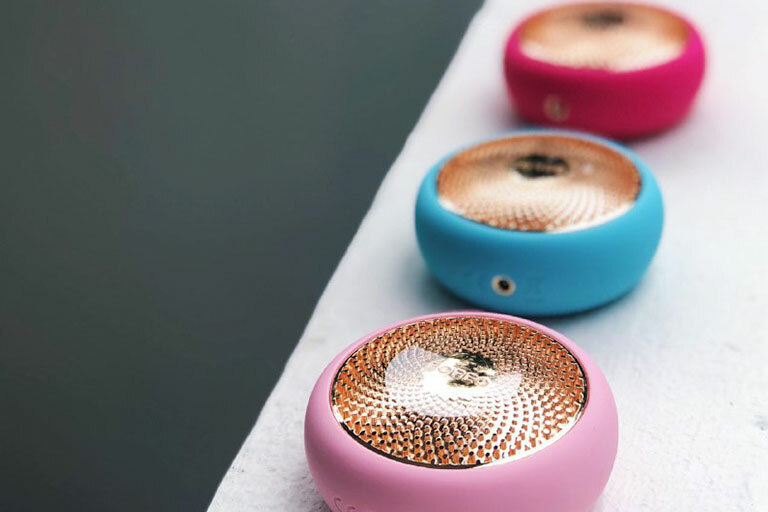 The FOREO UFO comes in three colourways (L – R) – Mint, Pearl Pink and Fuchsia. If you think you can’t afford the time for a face mask, well think again. 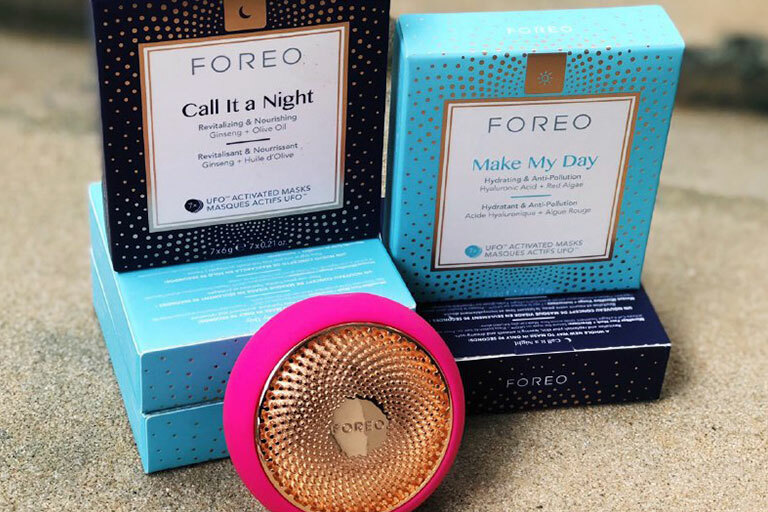 FOREO has released one of the most unique devices to land in the market — the FOREO UFO Smart Mask Treatment. This little palm-sized device has reinvented the concept of beauty tech with its one-of-a-kind high-tech system configured to give you the best masking experience you can find out there. Want to know more about this futuristic skincare device? Read on to find out what we think and find out more about how this fancy device faired on our skin. What is the Foreo UFO? This little handy device is the first of its kind. The UFO promises all the benefits of face masks, but within a speedy 90 seconds timeframe. Essentially, its a gift from heaven if you’re one who’s constantly struggling to set aside time for a little TLC for your skin. The innovative new smart mask device from FOREO comes with an assortment of treatments for you to choose from. The device takes on the form of a circular handheld device that imitates the shape of well, a UFO — duh! Think of it this way — it’s like a decadent facial treatment for your face, the kind that we’d get from K-Beauty brands. And if you know about K-Beauty, you know it keeps your skin fresh and poppin’. The interesting part about this device, aside from its heavy price tag, is that it’s built with 3 different light sensors — red, green and blue. It may sound a little gimmicky at first, but truth be told — it’s been around for a long time. Studies have proven that participants who have undergone LED treatments twice a week, showed “significantly improved skin complexion and skin feeling” – which essentially translates to better, radiant skin. RED: It’s called Thermo-Therapy and it reduces inflammation and promotes circulation in your skin. It works to erase signs of ageing such as fine lines and wrinkles while stimulating collagen production. GREEN: Usually found in Day treatments, the Green LED light uses Cryo-Therapy which helps to break melanin for easier absorption and reduces puffiness on your face while brightening your skin’s complexion. It’s literally the best pick-me-up for your face, especially in the morning. BLUE: The Blue LED works the same, but in this case, it’s used to kill acne-causing bacteria while stimulating blood circulation in your skin. The new UFO comes with 3 RGB LED lights, T-Sonic Pulsations and customizable temperature settings catered to treat your skincare woes. There are two temperature modes that come with the UFO – Thermotherapy (Hot) and Cryotherapy (Cold). Built with Hyper-Infusion Technology, the heat that comes from the metal plate of the device helps with the Thermotherapy which opens up your pores to enhance skin absorption of mask essences while boosting blood circulation and locks in moisture and nutrients from the mask. There’s also the use of Cryotherapy which essentially lifts and firms your skin, which reduces the appearance of pores and puffiness. The T-Sonic pulsations work to massage your face and increase the effectiveness of the RGB LED light therapy which comes with the UFO. When comparing the day and night treatments, T-sonic waves pulsate more when it’s on thermotherapy mode which is used together with the night mask. What these T-sonic pulsations actually do for your skin is that it opens up the pores to allow easy absorption of the products to your skin. The T-sonic pulsations and light therapy used together with the day mask, on the other hand, is far more gentle and light, leaving you with fresh and plump skin. What kind of masks are there? UFO masks: Make My Day (left) and Call It A Night (right). Comes with 7 pieces. Using quick and effective LED light therapy and advanced Hyper-Infusion Technology, the UFO masks transform your usual 15-20 minute sheet masks into an efficient 90-second treatment. Most importantly, there’s one thing to note when using the UFO: the device is only compatible with the UFO activated masks that are sold separately with the device, so it’s best to not use it with the other sheet masks that you have at home. Ever find yourself waking up and realising your face is puffy? Thankfully, the Make My Day mask solves all our troubles. When used together with this mask, the UFO emits red and green led lights which helps to eliminate the puffiness in your face while promoting good blood circulation. Besides, sparing 90 seconds of your time in the morning can’t be that tough. 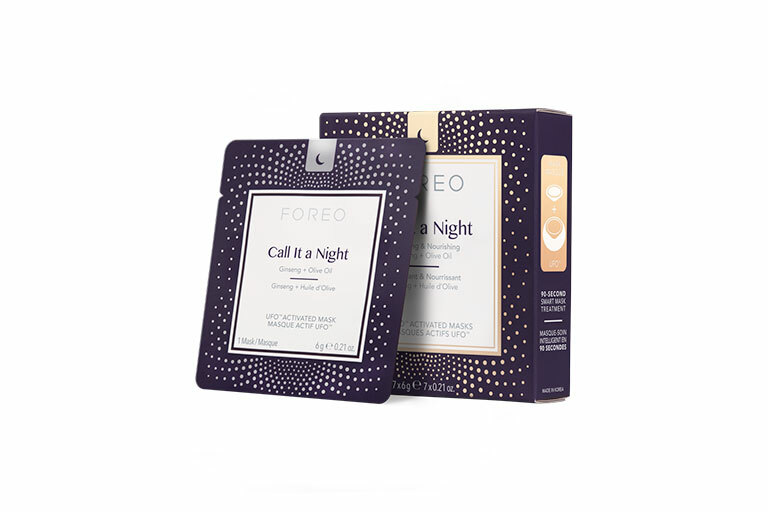 FOREO Call It A Night Mask, $16 for 7 pieces. Formulated with anti-ageing properties, this night mask works to relax and nourish your skin, while keeping it soft and supple. When used together with the UFO, the device emits red led lights, with T-sonic pulsations which invigorate your skin for better absorption while stimulating good blood circulation. This indulgent facial is the best way to treat your skin after a long and tiring day at work. 1. Cleanse and tone your face. 2. Download the FOREO For You app onto your smartphone. Then, connect the UFO to your smartphone via Bluetooth. 2. Follow the instructions as shown above and apply the sheet mask to the UFO device. Step 3: Scan the barcode found at the back of the mask pack with your smarphone. 3. Scan the barcode found at the back of the mask pack with your smartphone. 4. Apply the UFO on your face and move it gently across your face in circular motions. 5. After the time is up, gently tap in the essence on your face to make sure it’s fully absorbed or you could repeat the treatment again by adding more of the essence from the sachet to the top of the mask. 6. Make sure to dispose of the mask and wash the UFO by running it under water so that it doesn’t leave any residue. I’ve to admit: Masking, is indeed, one of the things I look forward to the most when it comes to my daily skincare routine. So when I heard that FOREO was releasing a new device made just for masking, I was so stoked to try it. Now if you’re someone who shares the same love for beauty and skincare, then you might just dig this. First of all, I was appalled by the price tag that it came with, considering the amount could’ve paid for at least 4 facials. So I was kind of skeptical when I first got my hands on it. Nonetheless, I was sure with a hefty price tag for a device like that, it probably should work. Yes, it may be quite a hassle to download the app itself on your smartphone and pairing it for the first time may be kind of troublesome for some. Still, the app works just fine for me – in fact, I kind of enjoyed masking to the unique compilation of nature sound effects that came with the app. Glide UFO across clean, dry skin and massage the formula in using circular motions. I used the UFO every morning before applying my makeup and I felt that it helped to get rid of the puffiness that I was accustomed to waking up to everyday. I wasn’t sure if it was just the placebo effect but I could feel the difference after continuously using it after each day. I also felt refreshed and my skin was reinvigorated after the whole treatment. Plus, it didn’t affect my makeup application at all because it absorbed into my skin pretty quick. As for the night mask, the UFO used thermo-therapy, of which, combined with T-sonic pulsations, felt really nice and relaxing on the skin. It was a much-needed facial to refresh my tired and dull skin after a whole day at work. I would say the UFO does what it promises and I was definitely not disappointed as my skin worked well with both the products. It also saves so much time so I was more religious with masking considering the amount of — which is a plus if you’re always busy and have no time to give your skin the time and attention that it much deserves. However, I’d recommend getting this mask if you’re willing to splurge a little more on your skincare considering the fact that it does come with a big price tag. The UFO devices in three colourways (bottom to top) — Pearl Pink, Mint and Fuchsia. I’m not a fan of face gadgets and devices, and I approached this new “masking” device with some apprehension. What is it? How does it work? How can it work? The device is nice and compact (so if I like it, yes, I would actually travel with it); and the matte packaging is lovely — no grubby fingerprints and easy to grip! Next, I had to download an app to activate the device — it was initially bothersome to have yet another app on my phone, but after I saw how it worked, it makes sense… it scans the mask to set the “program” for it (I tried the “Call It a Night” mask, made in Korea), and illustrates how to install the mask onto the device, and use it on your face. The UFO lit up in red and became warm… really warm. I did not expect how warm it would be; but it felt nice and comforting. I really liked that my skin felt calm throughout the whole treatment, and that it only took 90 seconds to complete. The UFO is truly a revolutionary skincare gadget that will change the industry. I imagine it won’t be long before we see all the copycats come out. 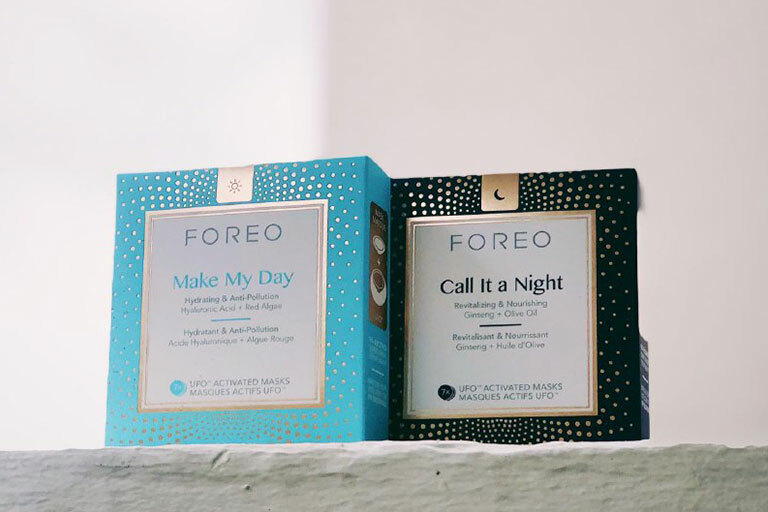 As for the compatible masks available, FOREO has a good range (there’s even one dedicated for the eye area, infused with caffeine), and to be honest, I’m now actually looking forward to trying them all. The equivalent of sheet masks in… 90 seconds. I was surprised at the claim of this little high-tech device, and as an avid lover of facial masks, it got me intrigued. 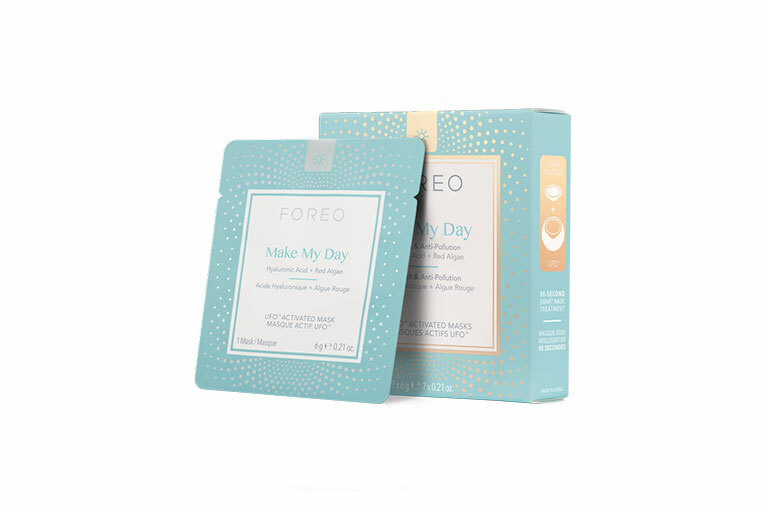 Fresh out of the packaging, the set-up was quite simple — I did have to download an app though, but other than that, it’s just about popping FOREO’s specially-fitted sheet masks into the circular device, switching it on, and listening to the audio instructions from my phone. Maybe the app did come in handy after all! On my first use, I truly got a shock. See, I was supposed to sweep the device in gentle, circular motions around my face, but soon, it started warming up. It was not an unpleasant feeling though! In fact, the gradual heat felt relaxing, and I later found out that was helping to infuse the mask’s active ingredients into my skin. Along with the warming effect, there were also T-Sonic pulsations that felt like a facial massage, and even LED Light Therapy to target various skin needs. Basically, the UFO had it all! Impressive. There’s also a cooling mode, and all this can be tweaked independently from the app for your own regime. I did like how the device delivered on so many aspects, which made it very worth it compared to the other facial devices in the market. However, I’ve always been skeptical of things like light therapy, rollers, etc. — trying it for one week didn’t seem enough. I did feel like my skin absorbed the serum well after, because it gets plump and matte-like, but the sensation is totally different from the intense hydration I’ll feel after a sheet mask. Is it a fair comparison though? I did enjoy the calming process of using it, and for a device that shortens my skincare regime while being this multi-functional, I can safely say I’ll be using it quite a while. I’ve been eyeing FOREO’S UFO as it was a facial device that uses LED lights to fully maximise the effects of a sheet mask. I was a bit turned off at first because you had to download and connect your device to an app (which is a huge hassle), before I found that you could just press the power button to start the treatment (press once for Make My Day, press twice for Call It A Night). Although if you do want more control over the T-sonic pulsations and temperature, you still need the app. I quite enjoyed using UFO as it feels like I just went through a mini facial every time I use it. Every morning after using the mask, I found that my skin was nicely hydrated and supple. The only thing I didn’t really like about the UFO was the round design — it was hard to get into the crevices of my nose. To really get full use out of the sheet mask, I recommend squeezing out all the serum from the sachet onto the mask after you’ve fixed it to the device before starting the process. I really loved how the entire masking process only took 90 seconds tops, which are good for days when I’m really tired and not up for waiting 15 mins for my sheet masks to work its magic. 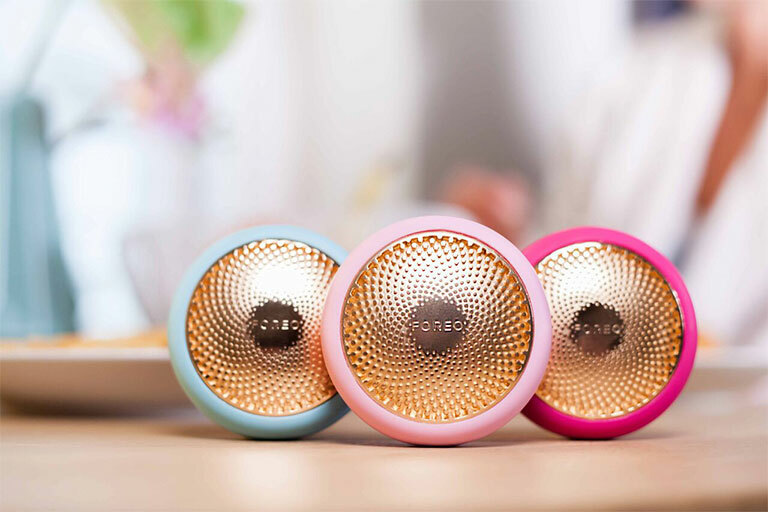 The FOREO UFO ($408) is available online, and at FOREO’s new store located at TANGS Orchard and Sephora. Available in 3 colours — Fuchsia, Pearl Pink, and Mint.